ForexTime Limited (FXTM) has strengthened its executive team with the appointment of Jameel Ahmad as its newest Vice President of Corporate Development, according to an FXTM statement. In his new role Mr. Ahmad will be tasked with managing and steering the implementation of the broker’s internal and external communications strategy, whilst fostering FXTM’s market research capabilities in his ongoing role as its Chief Market Analyst. Mr. Ahmad joined FXTM originally in May 2014 as its Chief Market Analyst – during his short tenure, Mr. Ahmad has already played an instrumental role in expanding the profile and development of FXTM. Prior to FXTM, he worked at a number of financial service providers in research-focused roles, including stops at Blackwell Global, Talent Intelligence, among others. “Jameel has already played a valuable role in showcasing FXTM’s international profile and expertise, and he will continue to do so in his new role, leading the communications with our global client base and the wider business community. With his know-how of the forex industry and in-depth knowledge of the financial markets, we feel his insight will be a great asset to the FXTM management team,” she added. 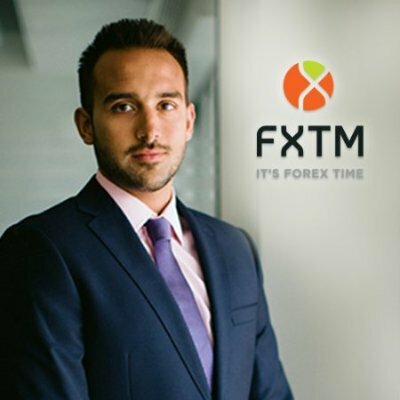 “FXTM is a young and dynamic brand which is constantly evolving to the needs of the forex market and the company’s clients. Since joining the company a little over a year ago I have been impressed with the rapid growth the company has seen, as well as the investment the company is constantly making in its products and services. Now is a very exciting time for the company, and I look forward to contributing to expanding FXTM’s global footprint, and global business,” noted Mr. Ahmad in an accompanying statement. Earlier this month, FXTM made headlines after the Autorité des marchés financiers (AMF) issued a warning to the public and added FXTM to its black list as an unauthorized entity in Quebec.